Entertaining multitudes of friends and acquaintances during the holidays is as easy as making awesome food, which is to say it's not really easy at all. Here's the help you need: this recipe by Top Chef season one winner Harold Dieterle. 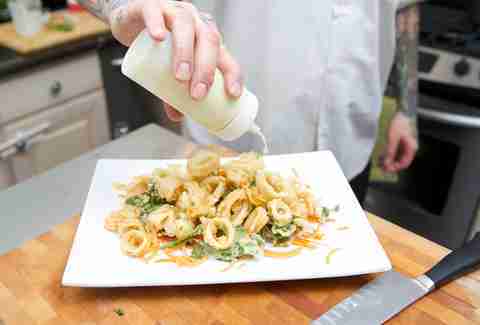 It's transformationally tasty calamari that's sure to entertain the stomachs of even the grinchiest party goers. Preheat oil to deep fry at 375 degrees. In a bowl, mix together the flour and soda water to make tempura batter. Beat the batter vigorously to avoid lumps and strain. Coat the watercress and calamari in tempura batter and deep-fry until golden brown for 3 minutes. Lay on paper towels and season generously with salt and pepper. 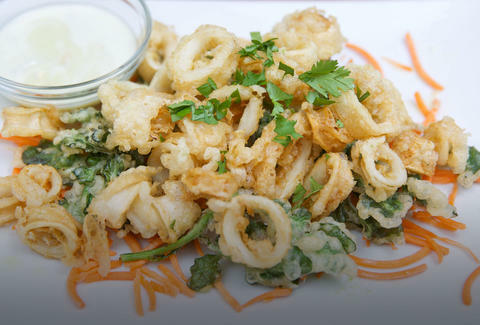 Place the crispy watercress and calamari in a bowl and mix with shallots, chives, mint leaves, salt and pepper. To make the dressing, add the lime juice, oil, fish sauce, chili, garlic, palm sugar in a blender. Purée until smooth, then strain. Add the dressing to the fried mix and serve.